Effective and reliable cat tracker. Find your cat in the hardest to find places or train them to return on command. 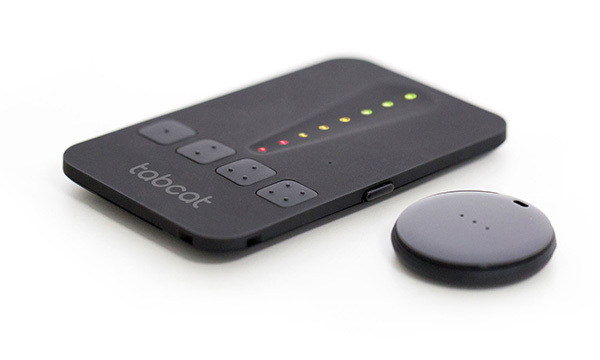 Tabcat is the revolutionary cat tracking device that lets you keep on top of the whereabouts of your pet. Attaching easily to your cat’s collar, the device is lightweight but robust enough to stay on whatever they get up to. With an astonishing degree of accuracy in guiding you to your cat’s exact location, the Tabcat tracker is more effective, much lighter and affordable than GPS or other systems to help ensure you can find them. Unbelievably simple and intuitive to use. Perfect for cats or kittens. Each directional handset can find up to four cats. Just attach the lightweight tag to their collar. Beeps and lights will guide you right to them. The directional handset picks up the signal from the cat tracking tag on your cats collar and then tells you which way to walk to find them. A single red light tells you’re in range and then as you walk in the right direction and get closer lights go to amber and then green guiding you right to your cat. Find your cat wherever they might be hiding. Our patented Radio Frequency based technology is accurate enough to find where they might be hiding in the house as well as in neighbouring gardens and streets. They may not travel far (cats are very territorial), but they can get trapped in sheds or garages, stuck up trees, or chased by dogs and become disorientated. Range of up to 122 metres. Guides you in to within 2.5cm. Tabcat cat tracker can track your cat up to 122 metres (400 feet) in clear line of sight and guide you right in to their location, within 2.5cm. Rest assured that while your cat's in range, you should always be able to find them. Cats tend not to wander very far, so in 99% of cases a quick walk about will quickly and easily find them. Train your cat to come home on its own accord. About 70% of customers that we’ve spoken to said their cat came back on its own when they pressed the locate button. This activates a small beep on the tag. Increase the chances of them coming back with some initial training so they associate the beep with a treat.